The journey of the iconic series is spread out over ten years and eight seasons, which the HFPA has followed very closely. 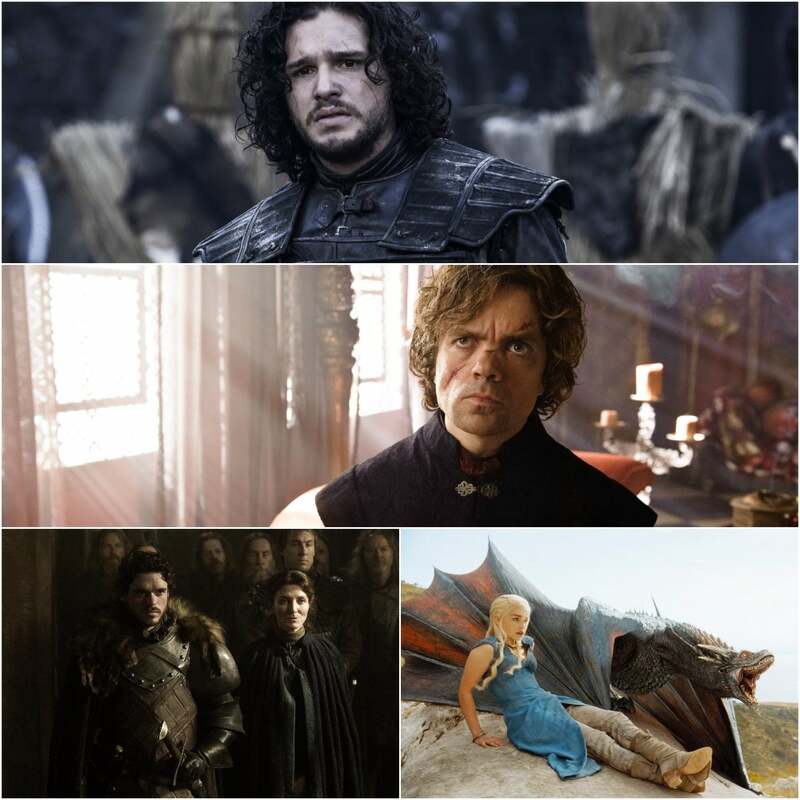 From unknown quantity to HBO’s most successful series ever -spectacular viewership worldwide, six Golden Globe nominations and one win, for Peter Dinklage as best supporting actor/TV- Game of Thrones established a new benchmark in TV production and put the fantasy genre right on the forefront. Nicolaj Coster-Waldau, Jaime Lannister: Yes, I can tell things are changing. Yesterday was the weirdest arrival I‘ve ever had in LA. There were a lot of cameras and people asking for autographs at the airport which is a new experience, at least for me. D.B. Weiss, series creator, executive producer: At this point, I think we have the probably the largest cast ever in the history of television. Even with a cast our size, there are lots and lots of condensations and outright missions that we need to make. We focus on most of all (the characters) in terms of the big picture. Faithful to the spirit of the books, not necessarily the actual letter of the books. Michelle Fairley, Catelyn Sark: We’re a happy bunch of people. Everybody has been together for three years now. It’s pretty much the same crew since Season 1. So it feels like family basically. Everybody’s after the same goal – they want to do a great job and they want to do it well. David Benioff, series creator, executive producer: It’s an all-consuming job because it’s six months for the actors but then we’re in post-production immediately after we finish our production and then we immediately start outlining the next season, even though we don’t have the green light yet for the next season, we have to be prepared for it. So we’ve outlined Season 4. We’ve begun writing the episodes and the truth is there just isn’t time for anything else. And I think it would be frustrating with any other job, we love the show so much that it’s still... I mean, even for Season 4, you know, outlining Season 4, I’m getting so excited talking about scenes that are coming up and you know now starting to talk about how the whole series will end has been a really thrilling and exciting... Because you work on something for so long... You know Michelle was saying to me this is the first time she’s worked on something that’s lasted so long. That’s exactly the same for me. Michelle Fairley: _There are adverse weather conditions, particularly (when we're shooting) in Belfast. If we’re outside we can have the rain one minute and the snow the next and then hailstones and back to the rain and then sunshine. But when’ we’re in the studio it's fantastic. It’s absolutely brilliant. It’s lovely and warm. Maisie Williams, Arya Stark: The hardest parts are going through mud, scenes with fighting in mud. But I must say they're the most fun too. Kit Harington, Jon Snow: Me and Emilia (Clarke) share a strange sort of journey in this show. The main bulk of the action happens in King’s Landing or in the south and then you've got the Daenerys story over in the lands beyond the sea and you’ve got my story up north. We sort of bond together yet we never met so far in the series. We never had a single scene together. But we’re very close friends offscreen because we shared that experience of being two young actors in this show which is become much bigger than we ever thought it might be. Peter Dinklage, Tyrion Lannister: Being Tyrion is a double-edged sword because I have an expectation to live up to. People really, really love this character and they loved it way before HBO got involved. Or myself. It’s very nice that people have responded well to my attempts. Sophie Turner, Sansa Stark: At this point (in the series) everything collapsed. Sansa is held prisoner, Rob and Catelyn are trying to fight this war. And suddenly everything’s gone into mayhem and chaos. And that’s when I think the story became the story. That when you get to see the characters’ truth. Richard Madden, Rob Stark: Rob has a very strong moral compass, and this is at the same time his strength and his weakness. He does what he thinks it’s right and honorable. This moral compass compels him to do things that maybe would put him in danger and aren’t the best option for him. He marries this girl because he truly loves her, he’s honest and following his heart but he’s breaking an oath and screwing a relationship and it can affect the whole war. Peter Dinklage: At this point, it’s clear to me that Tyrion’s greatest strength is his intelligence. But in this world, he has a great compassion that a lot of people don’t have. Even though he's done some naughty things he’s got a big heart. And he never sees himself as a victim. He would die if he did that. 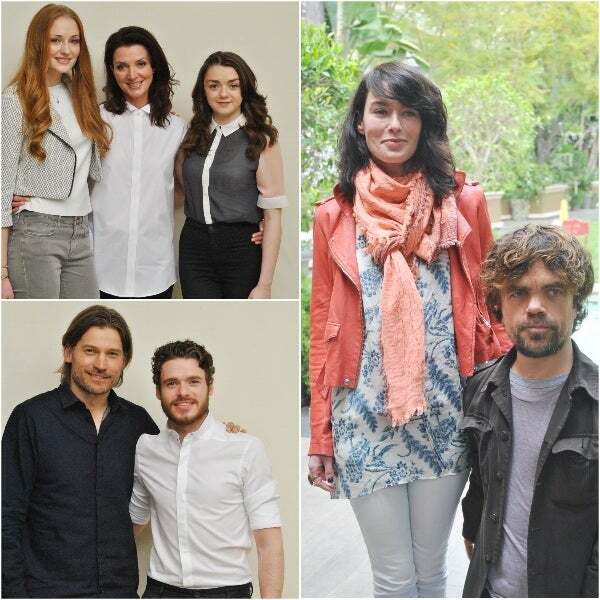 Westerosi friends and family, clockwise from top left: Sophie Turner,Michelle Fairley, Maisie Willimas; Lena Headey and Peter Dinklage; Richard Madden and Nikolaj Coster-Waldau. Maisie Williams: Arya’s strength is that she’s not afraid to say what she thinks. And that’s her weakness too. Sometimes she gets her point across and people realize who they’re dealing with. But sometimes that leads to ger making decisions quickly and getting herself into more trouble than was necessary. Emilia Clarke, Daenerys Targaryen: The joy about Daenerys is that she keeps evolving so much every season. Right now it's almost like she’s an entirely different person. She's evolving from a girl into a woman. Her ability to take charge of 8,000 men in the army was certainly a surprise (for me). But then after the dragons everything sort of pales in insignificance after all. Sophie Turner: The thing about Game of Thrones is that women are portrayed just as strong if not stronger perhaps than the men in the show. The women are very tough. Michelle Fairley: The women learn very quickly how to survive in this world, no matter what role they have. They’re not only mothers or daughters or sisters or wives or working for Littlefinger. They learn pretty quickly how to judge a situation. It’s about survival but it’s also about having a certain level of honor. Sophie Turner: Sansa's greatest strength is that she picks up things from all the people she sees. She picks up techniques and she’s very good at watching people and learning from them. At the end of season 2, Sansa picked up manipulative techniques from Littlefinger and Tyrion. She’s a very good learner. She learns quickly and now she’s very good at deceiving. Nicolaj Coster-Waldau: I really believe that Jamie is who he is because he grew up without a mother. That’s a big deal. His father has kind of been a single parent if you will. And he’s bonded with his sister and she’s become the love of his life. And now he’s on a journey with a woman that he really had no time for, in the beginning anyway, Brienne of Tarth. Cersei has defined his life in so many ways. But Brienne is a new, different element. Keep watching, this will become a significant relationship. Richard Madden: The show has been successful because it does relate and reflect on the world at the moment. It’s a drama about people in extreme situations. Everyone can relate to that. It’s very relevant to society now when so many people don’t have jobs, can’t get an education, or don’t have the money or there are wars going on. And Game of Thrones has all that on it, you can relate to that. David Benioff: What’s really fun about (Game of Thrones), screenwriting wise, is that you’re writing for these faces that you know so well now. You’re not writing for just a name on a page. I mean you know the actor so well. You know how they would perform a scene. Or maybe they’re going to surprise you with a lot more thrilling end. So we want to see this one through. I mean we think we have an opportunity here to tell a story, a long story, from the beginning all the way through to the end. And if that means, you know, sacrificing some movie projects or even books for that time span, it seems worth it to us. D.B. Weiss: George has confided in us on secrets. We went to Santa Fe to sit with him for a week and talk about how the whole saga ends, and so he made us swear, write our names in blood and all the rest. But...he shared it with us. It’s good to know well in advance as we’re building the story.